Rajan Zed, president of Universal Society of Hinduism, delivers a prayer from Sanskrit scriptures before the Idaho Senate in Boise. 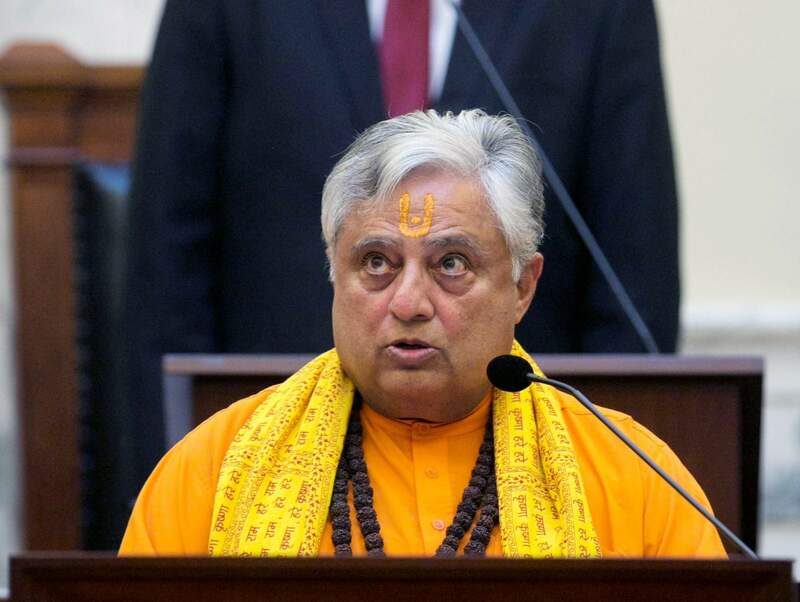 The spiritual leader from Nevada was expected to deliver the first-ever Hindu prayer in the Oklahoma Senate on Monday part of an interfaith effort in a Legislature that has faced some criticism for its lack of religious diversity. 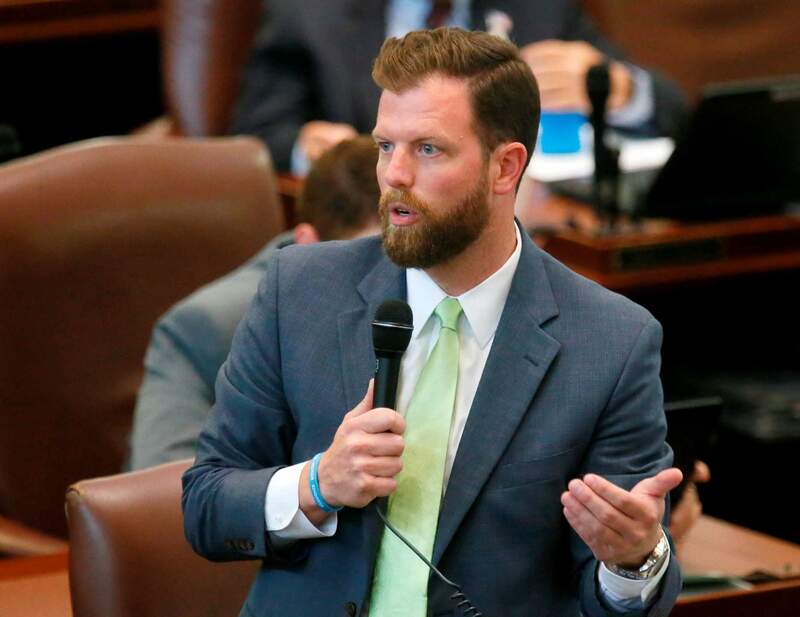 OKLAHOMA CITY – A spiritual leader from Nevada will deliver the Oklahoma Senate’s first Hindu prayer, part of an interfaith movement in a Legislature in the Bible Belt that has faced criticism its lack of religious diversity. Rajan Zed, president of the Universal Society of Hinduism, will visit Oklahoma on Monday as part of his effort to pray before lawmakers in state Capitols across the country. He is the guest of state Sen. Stephanie Bice, an Oklahoma City Republican who also has invited a local rabbi and people from the Church of Jesus Christ of Latter Day Saints and African Methodist Episcopal Church to pray before the body this week. Oklahoma state Rep. Jason Dunnington, D-Oklahoma City, speaks on the House floor in Oklahoma City. Spiritual leader Rajan Zed, of Nevada, is scheduled to deliver the opening prayer at the Oklahoma Senate in Oklahoma City on Monday. Dunnington criticized Republican leaders in the House earlier this year after his request to have a local Muslim cleric deliver the opening prayer in that chamber was denied. Strohm, who didn’t return phone calls or emails seeking comment about the matter, resigned as head of the program this month, and House Speaker Charles McCall has said he plans to align the visiting minister program with the one used in the U.S. House, which is more interfaith oriented. The flap over Oklahoma’s chaplain program reignited last month after a Baptist minister delivered a nearly 17-minute sermon in the Senate and suggested gay marriage and “immorality” were to blame for recent school shootings and natural disasters, drawing a sharp rebuke from the chamber’s minority leader. Zed, who said the purpose of his legislative prayers is to create awareness about the harmonious co-existence of diverse religions, is no stranger to controversy. His first official Hindu prayer before the U.S. Senate in 2007 was interrupted by several Christian activists who had to be restrained by the sergeant at arms and were later arrested. 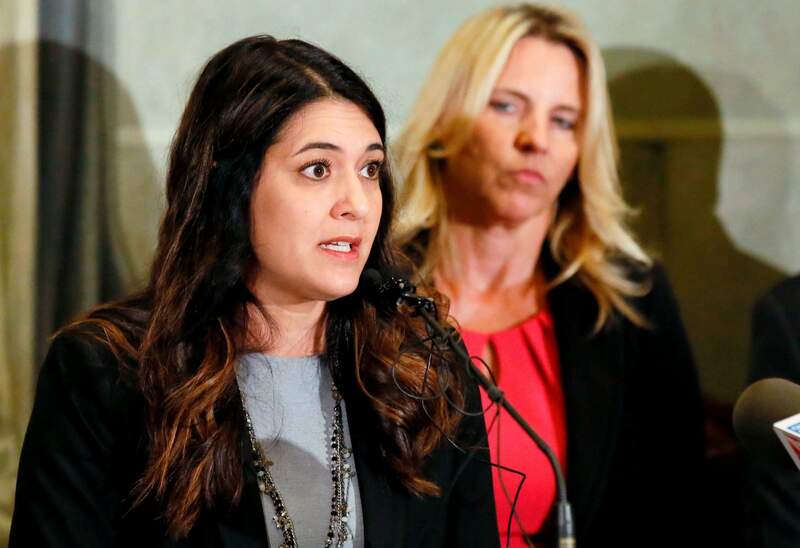 Oklahoma state Sen. Stephanie Bice, left, R-Oklahoma City, speaks during a news conference in Oklahoma City. Spiritual leader Rajan Zed, of Nevada, is scheduled to deliver the opening prayer at the Oklahoma Senate in Oklahoma City on Monday. Zed is appearing at the invitation of Bice, who has invited several interfaith leaders to deliver the opening prayer in the Senate next week. But in the decade since, Zed said he has seen a shift among Americans, especially young people, toward more acceptance and tolerance of different faith communities. “Youth is becoming aware that religion encompasses much more than their particular tradition and a broader, deeper understanding of religion is needed,” Zed said. Recent surveys on Americans’ views on religion confirm a growing number of adults, especially among millennials, who don’t identify with a particular religion, said Nancy Pittman, dean of Phillips Theological Seminary in Tulsa. “While my experience as a seminary dean leads me to believe that younger people are more open to other faiths, the bigger news is that they’re increasingly likely to not hold closely to any particular faith tradition,” Pittman said. Oklahoma Conference of Churches Executive Director Shannon Fleck said the Legislature’s welcome to leaders of different faiths sends an important message to the pockets of non-Christians across Oklahoma. About 2 percent of the state’s residents identified themselves as belonging to a non-Christian faith, according to a 2014 survey on religion by the Pew Research Center. About 18 percent didn’t identify with any religion. “We need to constantly remind everyone that although we are perceived as the buckle of the Bible belt, we are a diverse and widespread state with a vast religious experience, and that needs to be recognized,” she said.